Are you maximizing your profits while minimizing your inventory levels? If you hesitated to answer or said "no" to this question, we've got the solution for you! 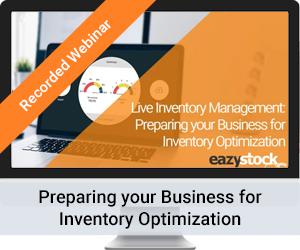 EazyStock's Live Inventory Management series is giving you the scoop on how you can Prepare your Business for Inventory Optimization. Find out how you can lower your inventory levels, gain insight into your supply chain, and boost your customer service levels.